It has only taken Dark Descent Records six years to garner a healthy reputation for releasing albums that tastefully blend new-school proficiency with old-school influence. The label’s even newer thrash sublabel Unspeakable Axe, which focuses on time-honored blends of extreme metal and thrash, seems well-positioned to follow in Dark Descent’s footsteps. France’s Mortal Scepter (formed in 2012) signed to Unspeakable Axe this past July on the strength of a single demo, and has now shared the first track from its upcoming EP. “Violent Revenge” blends old-school stylistic elements with a modern urgency, charging out of the gates with a minute of instrumental aggression that harnesses the tainted rawness of Bathory and Possessed before collapsing into a mid-tempo Kreator-esque groove sharpened by a noisy, bend-heavy solo. That deceleration is brief, though; the track picks up again towards its last minute and finishes off with an increasingly frantic vocal onslaught. Extremely prominent bass and an expedient burst of pentatonic shred around the 3:30 mark helps round out the otherwise angular attack. Stream “Violent Revenge” below. 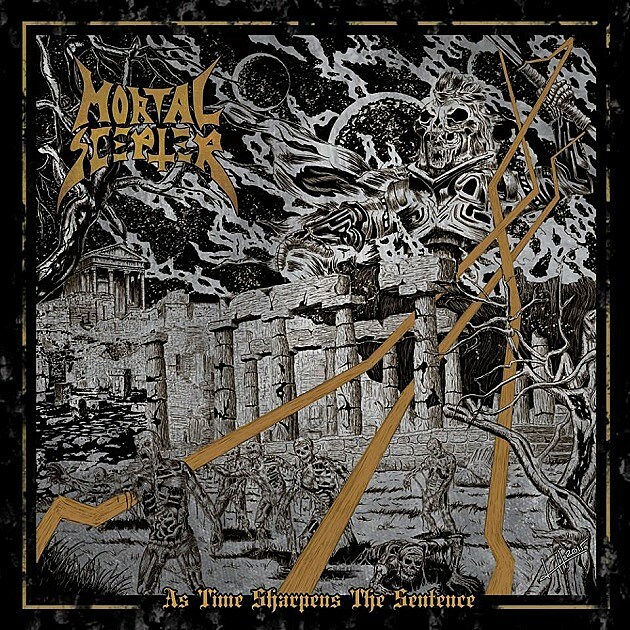 Mortal Scepter’s debut EP As Time Sharpens The Sentence is due out November 13 via Unspeakable Axe.